Perched high in a coniferous tree in Sandpoint, Idaho sits a hexagonal treehouse, handmade by 23-year-old Ethan Schlussler. During the build process, he grew tired of climbing up and down the ladder over and over. 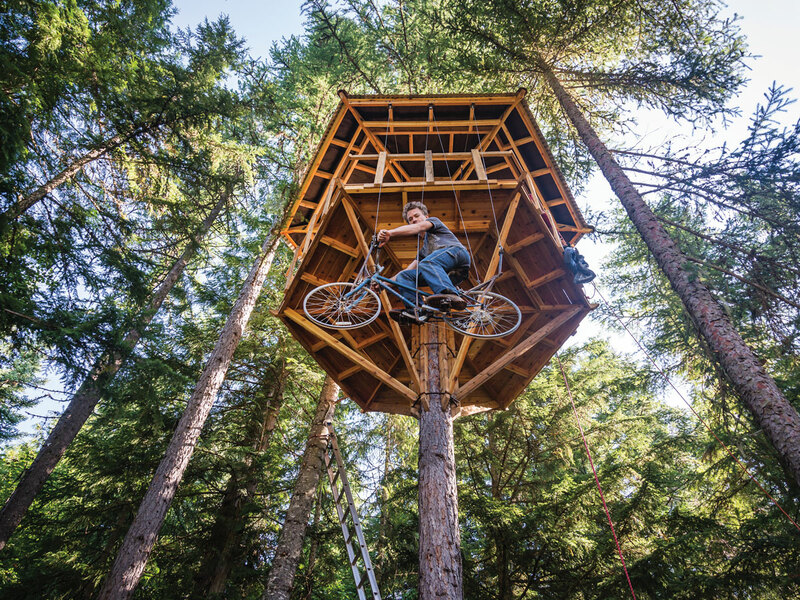 So he created a treehouse elevator, using his mom’s old bicycle. The elevator is a pulley system that uses a water heater as the counter balance. He modified the bike by moving the large sprocket from the front of the bike to the back to get a low enough gear. It takes him about 15 seconds to pedal the 30 feet up to his small front porch. The treehouse is made with lumber Schlussler hand-milled himself and preserved with Danish oil. He invented the friction system that keeps the treehouse aloft, which he describes as “experimental.” The roof is self-supported, which means it can move independently of the walls, to flex in the wind and twist with the tree. Two nearby trees with platforms connect to the treehouse via cable bridges, and there is a zip line that leads directly across the forested yard to his mom’s house. And the clever ideas just keep coming: Next, Schlussler plans to build a pedal-powered trolley car that he can ride back up the zip line. Check out video of the project build at youtube.com/theuninator.